Choosing virtualization software is one of the most important steps a network administrator can take as he will be dealing with that software for a long period. Troubleshooting, ease of configuration and installation and cost are the three most important factors, the decision maker should be aware of off. It also depends on which operating systems or application server, the company will be hosting on the virtual machine. The competition between different Virtual software providers in the market is really immense. Riding the best virtualization boat is not that easy, and choosing the right product is for a company requires a deep look on the market side and see what it is offering. 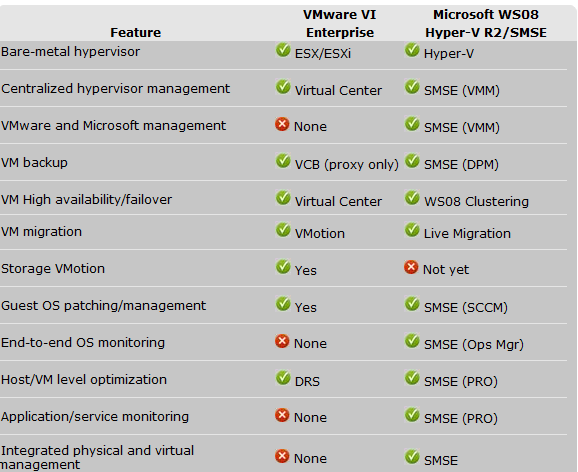 VMware and Hype-V are the two leading solutions is the virtualization market. Historically, VMware is older in the market and was known to have a great stability and online support, a lot of open forums and sources are known to be one of the most useful and successful Vmware features. Known as the leading operating systems manufacturer in the whole globe, and as the best seller of Operating systems in the world, Microsoft introduced hyper-v software to be their competitor virtualization product in the market, so they can run their own server and operating systems on. In terms of cost Microsoft is offering a very good and competitive price comparing to Vmware. A total cost of £6000 compared to £32000 is almost 5 times cheaper than Vmware has a great advantage of sales comparing it to Vmware, but is it all about the cost? Referring to all the above, Hyper-V will be the software used by the company as it is more reliable and cost the company less money if we think of getting windows 2003 R2, and use IIS 6.0 as a web server, exchange 2003 as an email server and MSSQL 2004 as a database server. The staff have a good knowledge of VMware solutions but saving five times the cost is worth changing to another Virtual solution. The virtualization concept is the same and Microsoft Hyper-V has as much management tools as VMware solution, in the addition of a great support team and lot of free web feeds and forums. The Hyper-V R2 requires a 64 bit system which is available with our Dell™ PowerEdge™ R805, the virtual machine hardware are hyper-v capable and the virtualization software will work properly on it. 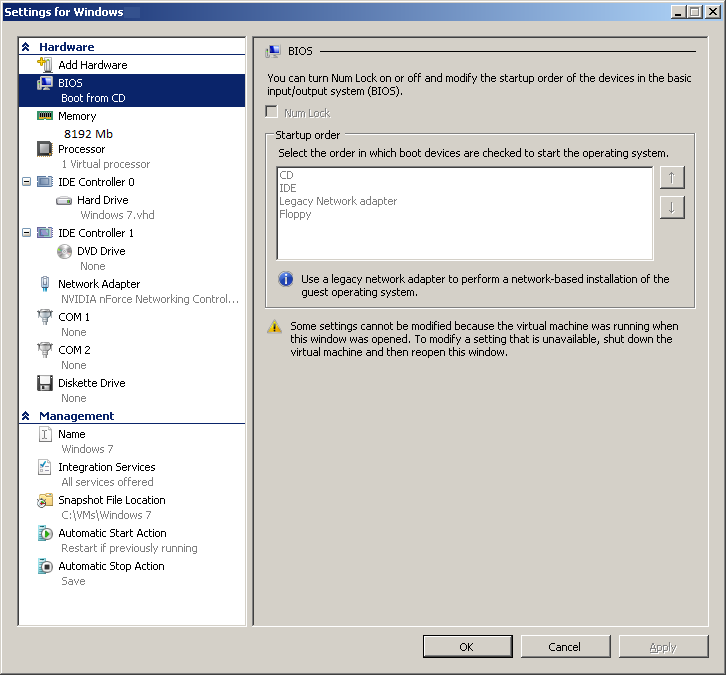 The Hyper-V configuration tool is intended to support the administrator with a menu driven User Interface (UI) to configure Hyper-V Server. 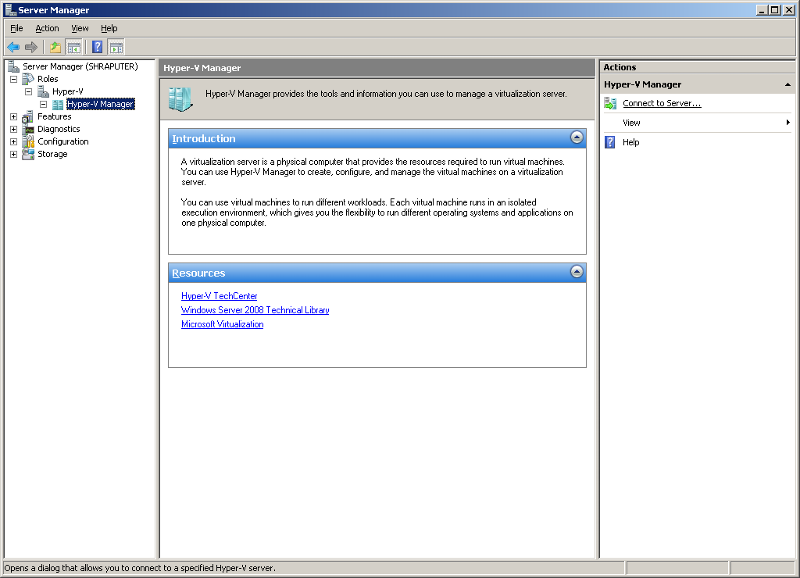 The Hyper-V configuration tool starts automatically at login of the system administrator or it can be started manually. At the first logion screen, the Hyper-V R2 software will prompt to assign it a new password for the Administrator account. 1- Virtual machine 1: HTTP server will be on Microsoft Windows 2008 Server R2, using IIS 7 as web hosting solution. IIS proved to be the most successful application for hosting websites on a Microsoft Platform. This machine will be used as the domain controller, active directory users will be created on this machine. 2- Virtual machine 2: Microsoft Exchange server 2007 which is known to be a very good and competitive email server, and compatible with most of the mobile phone, and offering the capability of E-fax, spam and content filtering as well as its main features of giving clients capability of synchronising their mailbox, calendar, tasks, public folders, contacts and the capability of receiving faxes. 3- Virtual machine 3: MSSQL server 2008 will be installed on this virtual machine. MSSQL is known to be very strong database software, which is leading the market these days. 4- Virtual machine 4: this machine will be the “Double Take” software which will be used to take over in case the domain controller fails. The “double-Take” server wakes up when the domain controller is no longer available on the network. 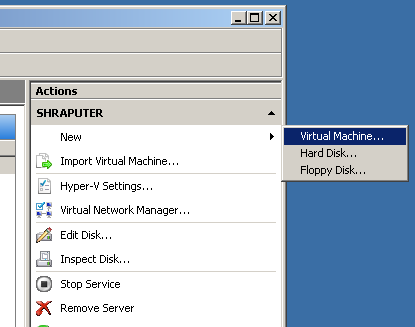 Then click next on the introductory screen which gives a brief description about Hyper-V with links to more reading. On the next screen we need to choose the NICS which will be used for the network configuration, and to allow internet access. After following the screen instruction, the virtualization software will ask for a system reboot. Now we can add the three remaining virtual machines, as the first one which as setup will be used for the domain controller. 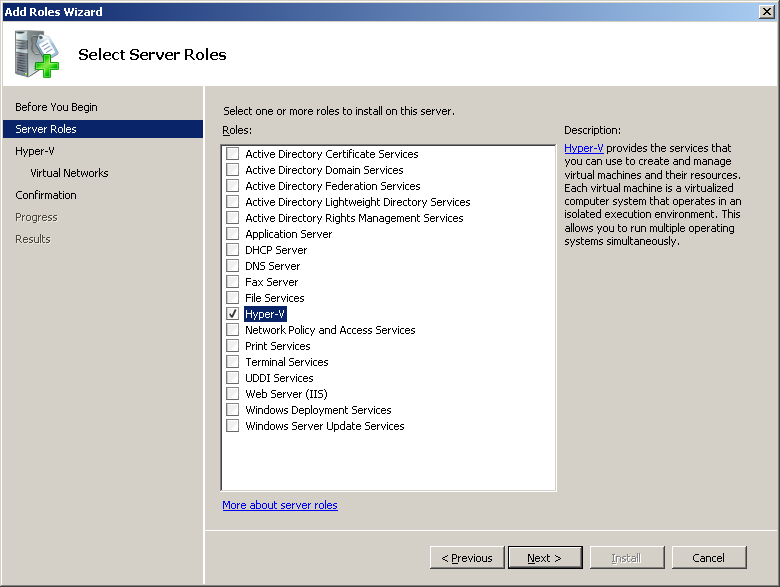 In the Server Manager still, expand the Roles now to find your Hyper-V role and then under that the Hyper-V Manager. Click on the Hyper-V Manager to change the right-side of the window to Hyper-V related tasks. Click on Connect to Server to begin. Now it is time to choose, the media source of the operating system we want to install, and for all of our virtual machine we will be using Microsoft windows 2008 R2. It always a good idea to mount the Windows 2008 R2 media, so later on installing the operating system will not require us to run the installation from the windows 2008 R2 media disks. After installing the operating system, on the virtual machine, we can now install the Operating systems and we are ready to assign the hardware share for the virtual machine. By clicking on the virtual machine settings on left hand side pan, we get to the following screen and we can start editing hardware configuration for each individual machine. We will assign two processors for the domain controller and 1 processor for each of the other virtual machine, with 8 GB memory capability for each virtual machine and then by clicking on ok, we will be able to save the settings. Referring to the Microsoft documentation about hardware requirements for windows 2008 R2, Exchange Server 2007, MSSQL 2008, the configuration we chose above should be ideal to run the virtual machines and their operating systems as well as their application servers. VSS-aware backup client will be an ideal solution to backup the virtual machines as it allows having a full backup of the virtual machines. Microsoft provides Windows 2008 R2 with a free backup which is an ideal solution to recover files and even partitions. The shadow copies can be enabled on each of the servers which allow having several instant backup when it is the case of recovering individual files. The backup requires having some kind of network access storage solution which is not really expensive these days, it has been proved to be a very good solutions. The Double-Take server machine can take control when the domain controller fails to load, by doing a domain controller election when the original domain controller is not available and promote itself to act as the new domain controller till the original domain controllers come back online. We should add that active directory is necessary on the domain controller and all of the other virtual machine (hosting Windows 2008 R2) should be joined to the domain controller domain.